In the the warm climate of coastal Georgia, in the southeastern United States where I grew up, most of the pies I ate as a child were chilled – key lime, lemon meringue, chocolate pudding. At Thanksgiving we didn’t eat the traditional pumpkin pie, we ate the harvest of our region: pecan. Explore the wonders of π. Write a piece that mimics pie: crusty on the outside, warm and gooey on the inside. 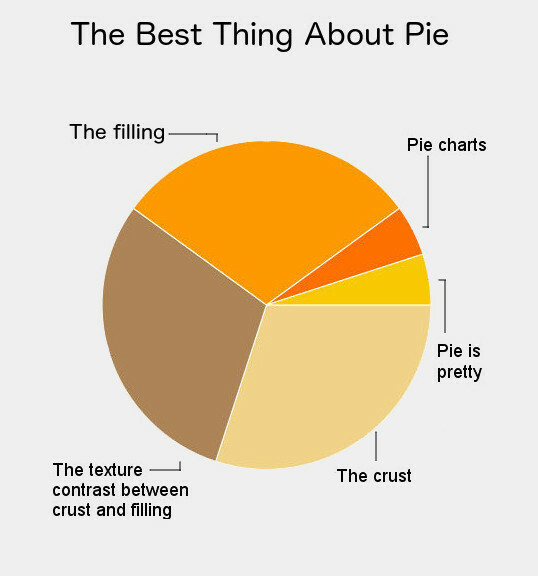 Don’t write about pie at all, but create a pie chart to illustrate your piece. Imgflip and Meta-chart offer free pie chart generators to get you started. When I married, my husband’s family introduced me to the pies of his Ohio roots, and I thrilled to discover cherry pie, strawberry rhubarb, and even grape pie: the harvests of their region. Pie, like many foods, can capture the essence of a place, and the people who populate it. Fillings, crust types, and preferences for savory or sweet vary from culture to culture, and over the years, I’ve become fascinated with pie. Families gather round it at the table, cooks gather round it in the kitchen, pioneers reinvigorated winter stores with it, ancient Greeks liked it meaty, Romans preferred it sweet. This week I invite you to write about pie. Write about the first time you rolled out a crust, or the number of pies on your table at family gatherings. Give us a recipe or explore the senses. Food writing evokes all of them: the velvet feel of filling on your tongue, the sight of berry juice bubbling through crispy brown slits, the sweet salty taste of sugared fruit and buttery crust. Pie varies depending on where you are in the world: some eat it sweet and cold, some savory and warm. Some call it crostata, some don’t eat pie at all. Write a piece in which pie in any form – tart, quiche, pizza, pirog – captures the essence of a place. Write a post about pie with the intention of evoking all five senses. Pay particular attention to taste and smell, two senses that are often underrepresented in writing. Does pie have meaning for you, your family, or your culture? Is it eaten only on special occasions? Do you prefer savory or sweet, or do you not like pie at all? Write about your relationship with pie and how it has evolved in your lifetime. Pies are used in comedy gags, make their way into movie and song titles, are familiar to us from nursery rhymes, and even have a chart named after them. What is it about pie that makes it so loveable? Write an opinion piece about pie in popular culture. We can’t wait to see where you take us with this! On the west coast of Canada, in the months of July and August, I gather blackberries and huckleberries, for a tasty fresh fruit pie! I accept your pie writing challenge! who in time past spake. but I propose a new equation. make it a memorable occasion. The old rules need not apply. Tom – – You’re just the Pied Piper! This makes me want pumpkin pie! A good Pumpkin Pie is killer! I can’t wait to see what the pie competition inspires! My favorite part of any pie is the crispy outside……. Even our cat got into the pie baking experience: http://carolyncholland.wordpress.com/2008/11/26/the-snitty-cat-likes-pumpkin-pie/ It’s all about pumpkin pie—which I’m happy I don’t like or I’d become as big as a blimp. Never had those pies with fruits in them, like Apple Pie or Peach Pie or (some)berry Pie… Only ever had Chicken Pie or Shepherd’s Pie. Considering the ingredients that go into a pie, we do have a spicy variant that’s more of a Curry Puff. Does that count? Can you refer me please? Can I have my pie and write about it too? Who is the Betty Crocker of Pies? I don’t say “easy as pie” but I do say “piece of cake.” Bakery discrimination? Who eats “Pie in the sky?” The man in the moon! I’m getting my slice of the pie ready to post tomorrow morning, and I’m wondering if I’m thoroughly understanding the pingback process. I appreciate anyone who can advise! Osyth Seven for a secret never to be told …. Niki's Thoughts Pie, Pie, Pie! Life, Food and Me! I Thought I Would Have Pie! Glorious Results Of A Misspent Youth Kids Say The Darnedest Things! Tower Of Thoughts What is Pi? my writing blog always love the red cups, means chrissamus is a comin’!